Pharmaceutical Name: Radix Euphobiae Kansui. Part Used & Method for Pharmaceutical Preparations: The tuberous root is dug in late autumn or early spring. The root bark is peeled off, and the root is dried in the sun. Then it is soaked in vinegar. 1. Edema and full sensation in abdominal region. Kansui root (Gansui) is used with Pharbitis seed (Qianniuzi) in the formula Erqi Tang. 2. Ascites. 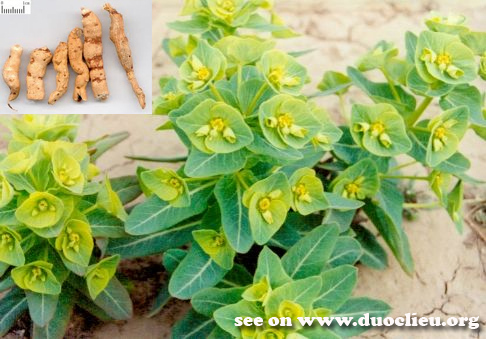 Kansui root (Gansui) is used with Peking spurge root (Daji) and Genkwa flower (Yuanhua) in the formula Shizao Tang. 3. Retention of water or fluid in the chest. Kansui root (Gansui) is used with Rhubarb (Dahuang) and Glauber's salt (Mangxiao) in the formula Da Xianxiong Tang. 4. Boils, carbuncles and furuncles. Kansui root (Gansui) is ground into powder and mixed with water for external application. 5. For epilepsy due to Wind Phlegm, it is used with Cinnabaris (Zhu Sha). Dosage: 0.5-1 g. It should be used in pills or powder because it does not dissolve in water. Appropriate quantity for external application. 1. This herb is best used in pill and powder form. 2. Contraindicated for weak patients or pregnant women. 3. It is incompatible with Radix Glycyrrhizae Uralensis (Gan Cao).